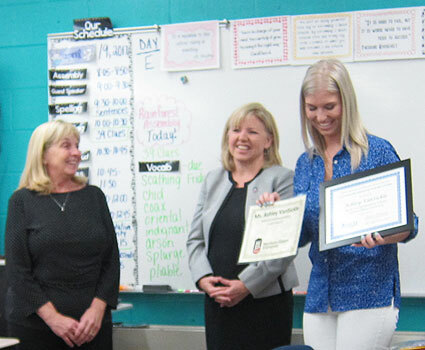 Ashley Van Sickle (right) receives her Outstanding Beginning Teacher Award from (left) Portia Downey, professional development coordinator in the NIU College of Education, and (center) Jennifer Johnson, the college’s director of teacher preparation and development. Ashley Van Sickle loves foreign languages and cultures. 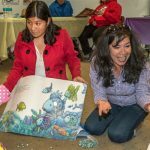 While earning her NIU bachelor’s degree in Elementary Education, she pursued a minor in Spanish. Her licensure endorsements include English as a Second Language along with language arts and social studies. Now Van Sickle is learning German, visiting Germany over her recent Spring Break and making plans for study abroad there this summer. 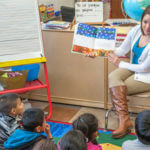 Languages are a passion she shares with fifth-graders at Rock Cut Elementary School in Loves Park, where the shelves in her classroom are stacked with optional books on Spanish, French and Russian. Some of her students, who come from multi-language homes and “are experts in their culture,” even are teaching those tongues to their classmates. The December 2013 graduate of the NIU College of Education, who began working in the Harlem School District just one month later, is the winner of one of the 2017 Outstanding Beginning Teacher Awards given by the Illinois Association of Colleges for Teacher Education. 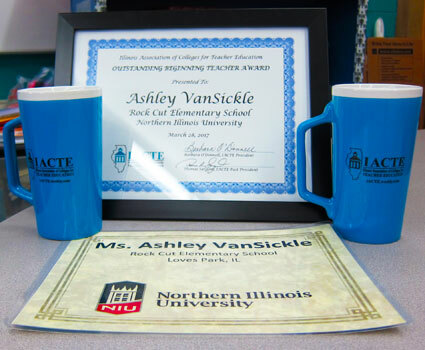 Representatives of NIU’s educator licensure programs put Van Sickle’s name forward to IACTE as their quadrennial nominee. Jennifer Johnson, the College of Education’s director of teacher preparation and development, and Portia Downey, professional development coordinator, traveled April 19 to Rock Cut to present Van Sickle with her plaque and other awards in front of her students, her principal, her mother and her grandparents. Mike Plourde, principal of Rock Cut Elementary School, says he is proud to count Van Sickle among his faculty and staff. He considers her a leader in his building, someone eager and willing to serve on committees and unafraid of taking advantage of opportunities. Indeed, Van Sickle teaches at her alma mater. She had no plans to come home after college, having student-taught in St. Charles, but Professor James Cohen notified her of a job opening at Rock Cut without knowing that she had attended the school. Cohen wrote a letter of recommendation for Van Sickle, calling her “respectful of her peers, noticeably contemplative of her actions and comments to others” and the “greatest advocate” for her future students. 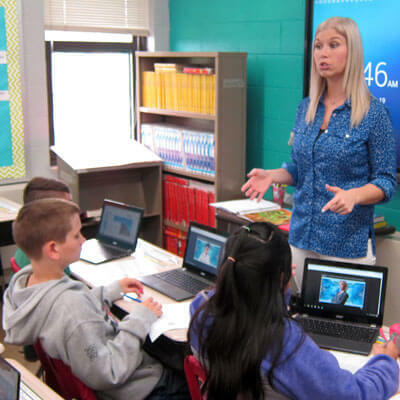 Van Sickle believes that good teaching begins with strong relationships, something she fosters with her students in the opening days and even weeks of the school year. “Building these connections throughout the year allows us to go further in our learning,” she says. Her curriculum includes “Einstein Hour,” when her students research subject-related topics of their own choosing. Some are exploring the science behind nuclear weapons, a topic they see in the news. Others with interest in origami are studying architecture and building 3D villages. Others are learning about recipes and hosting their own cooking shows. NIU enjoys some of the credit for her work, she says, pointing to the college’s “wonderful job” of securing her clinical placement. Her cooperating teacher in St. Charles made sure to show her “all sides of teaching,” including organizational activities and paperwork. Her College of Education professors, meanwhile, took advantage of small class sizes to make strong and lasting connections with their students. 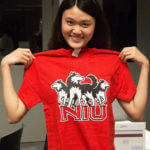 And “Once a Huskie, Always a Huskie” – Huskies are also the mascot of her alma mater, Harlem High School – Van Sickle has returned to NIU to pursue an M.S.Ed. in Educational Administration, otherwise known as the “principal prep” program. For now, though, she’s more than content with her current role in the classroom and her long-ago decision to change her major from business. “I thought to myself, ‘Will I be happy 40 years in the business world? Probably not.’ I wanted to become a teacher just because I want to do something for a career that would make a lasting impact, and I love working with children,” she says.